The 2017-2018 influenza season in the United States was one of the most severe in recent memory. 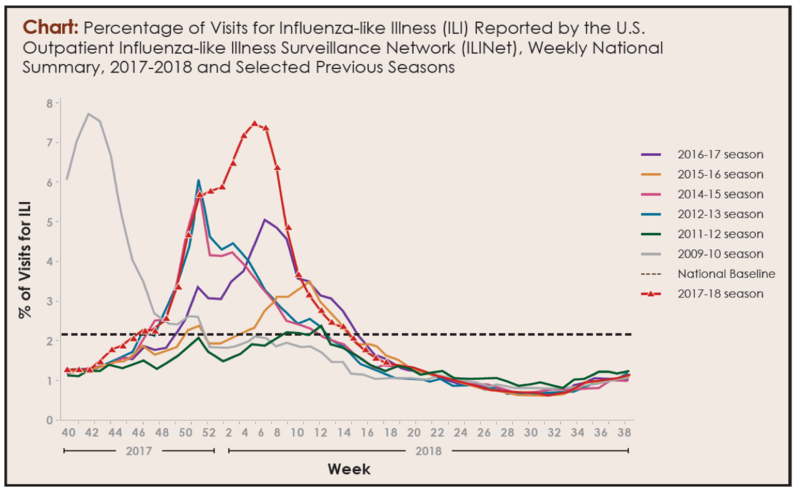 High rates of flu occurred all over the country simultaneously, in contrast to most seasons of the past decade, when certain states would peak with flu activity while others remained relatively quiet (see Chart). This sustained and widespread high level of flu activity resulted in a jump in hospitalizations. Death rates were highest in the over-65 age group, which is typical, but the second most affected group comprised those aged 50 to 64 years old; normally, the second highest death rates occur in children, from birth through age 4 years.1 The ferociousness of the flu season overall, combined with above-average impacts on younger baby boomers, made 2017-2018 one for the record books. “It was certainly a severe season,” Anthony Fauci, MD, director of the National Institute of Allergy and Infectious Diseases, told Contagion®. “Within the past 10 years, not counting the H1N1 (swine flu) pandemic of 2009, and just looking at seasonal influenzas, there’s no doubt that this has been the worst season we’ve had in the last decade.” According to data from the US Centers for Disease Control and Prevention (CDC), flu seasons that are considered serious typically occur when influenza A (H3N2) is especially prevalent, as it was this year. During a serious season, there can be up to 35 million cases of flu, with 700,000 hospitalizations and 56,000 fatalities. Part of the problem is that receiving the seasonal flu vaccine is far from a guarantee of avoiding the flu. Unlike with vaccines against diseases such as measles and polio, which offer 100% protection, getting a seasonal flu shot gives you a better chance of not contracting the flu or of having a less severe case if you do contract it. “This year’s interim overall vaccine effectiveness against both influenza A and B viruses was 36%,” said CDC spokesperson Kristin Nordlund. “That means a vaccinated person’s risk of having to go to the doctor because of an influenza illness was reduced by more than a third. The vaccination effectiveness against H3N2 viruses was 25%, 67% against H1N1, and 42% against influenza B viruses.” Nordlund said these numbers are in line with those of past seasons, when effectiveness of the vaccination against H3N2 viruses was roughly 30%. Against H1N1 and influenza B viruses, it’s been 50% to 60% effective. Although those aged 65 and older bore the brunt of hospitalizations and deaths from flu this past season, as they do every year—estimates are that 71% to 85% of all flu deaths every year occur in people in this age group— the group at next highest risk was those aged 50 to 64, the younger baby boomer cohort. This represented a deviation from the norm, in which the youngest children are the most vulnerable, after the elderly. Why did middle-aged individuals find themselves felled by the flu in higher numbers than in other years? Dr. Fauci suggested it had to do with imprinting, or the very first flu virus to which people in this age group were exposed as young children. “Your first exposure will influence how you respond for the rest of your life,” he said. “You have a better response to what you were initially exposed to.” In other words, there’s a good possibility that from the mid-1950s to the mid-1960s, when individuals in this age group were born, the viruses floating around were not H3 viruses different strains, such as H2. This could have resulted in individuals in this age group having a comparatively poor response to the strains circulating this past season. Compounding the problem is that each seasonal flu vaccine is created using data from past flu outbreaks, data that is more than a year old by the time the next flu season is underway. This lag time often results in a mismatch between the strains of the virus that are in the vaccine and the strains that are actually prevalent. “The virus protection would be 80% or 90% if we would be infected by the strains that are in the vaccine,” said Peter Palese, PhD, chair of the Microbiology Department at the Icahn School of Medicine at Mt. Sinai in New York. UNIVERSAL VACCINE ON THE HORIZON? 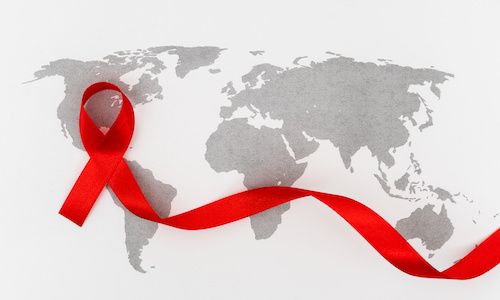 The big hope, of course, is a universal vaccine that will erase the need for the yearly shot. Dr. Palese is one of the researchers at the forefront of universal flu vaccine development. “My lab initiated the technology, which is referred to as reverse genetics,” he said, describing the process of creating influenza virus in the lab. “One of the things we succeeded [in] was to reconstruct the extinct 1918 virus in the laboratory.” This reconstruction, he explained, is used to create more effective vaccine strains in the future. His team is 1 of 3 at Mt. Sinai that’s working on a universal vaccine designed to offer lifetime immunity to the flu—or at least for a couple of decades. Although different strains of influenza emerge from year to year, compromising the effectiveness of the seasonal vaccine, certain parts of the virus remain identical from strain to strain. Palese and colleagues are focusing on these unchanging components of the virus and designing a universal vaccine that will target them. The goal is to make the universal vaccine “like a stealth bomber,” he said. “We are trying to fool the immune system.” So far, the vaccine has worked well when tested on ferrets, but large-scale availability for humans is a long way off. Two phase 1 trials that began this past fall and are expected to last more than a year have generated a lot of buzz in the scientific community. “We have good reason to believe….that it should work in humans,” Dr. Palese said. But when might such a universal vaccine be on offer to every consumer? “Ask me something easier,” he was quick to reply. CDC. 2017-2018 influenza season week 16 ending April 21, 2018. CDC website. cdc.gov/flu/weekly/weeklyarchives2017-2018/Week16.htm. Accessed on May 1, 2018. CDC. How influenza (flu) vaccines are made. CDC website. cdc.gov/flu/protect/vaccine/how-fluvaccine-made.htm. Updated November 7, 2017. Accessed on April 30, 2018. CDC. Cell-based flu vaccines. CDC website. cdc.gov/flu/protect/vaccine/cell-based.htm. Updated November 7, 2017. Accessed on April 30, 2018. Senator Markey secures funding in omnibus budget for his call for a universal flu vaccine [press release]. Boston, MA: Office of Ed Markey; March 23, 2018. markey.senate.gov/news/press-releases/senator-markey-secures-funding-in-omnibus-budget-for-his-call-for-a-universal-flu-vaccine. Accessed April 30, 2018.